Getting a blog started on WordPress is simple. It is the first step to take on your blogging journey. Blogging is a ton of work, but the technical aspects don’t need to be. I’ll teach you how to build a blog you’ll be proud of and get started. You can start a blog for less than $4 a month using the hosting service I recommend, Siteground. While you do not have to start a blog as part of your online business, it can make things a little bit easier. When you can quickly build a blog by skipping all the unnecessary overwhelm, you have a place to talk to your customers. (Ask me how I know about the unnecessary overwhelm). In today’s world, there are so many people selling things online. You need to be able to stand out. I know this sounds frightening, but really it is all about just being yourself. You might be the exact person someone is looking to work with. When you are selling something and do it by sharing your story you will get much further than if you just describe your product. In some cases everyone is selling the exact same item or saying a lot of the same things. There aren’t a lot of truly original and unique things in the world. A blog can help you to differentiate yourself from everyone else doing similar things. When you share your voice in a blog, people often feel like they know you. And in a way they do. They know what interests you, they know your voice, they know things about you that you share in your writing. This makes it easier for them to determine whether you are the right person for them to work with. I encourage you to strongly consider starting a blog so you can make a greater impact on your customers. A blog is part of an overall business strategy that allows you to provide something of value for free to the people you serve. The first thing to do when starting to think about blogging is to determine what it is that you want to write about. I’m going to be honest with you, this was hard for me. There are so many things to write about in the world. While I know a lot about many things, I cannot imagine writing about some things I know well more than a few times. This stalled me for a long time actually. The trick is to find something you are interested in, something you enjoy talking about or writing about, and that you have some expertise in. (I say some expertise because you do not need to know everything. See my post on how to be an authority on something). Since I returned to school and got a Master’s in Business Administration, I have been fascinated with business topics such as marketing, sales, and entrepreneurship. I decided to mix my love for psychology and business to create my blog around helping people overcome internal fears and self doubt to create a successful business. The next thing to think about is picking a domain name. You should think long and hard on this one because this is the name people will know you by and how people will find your website. There are several opinions out there on whether you should use your own name or come up with a blog name other than your own. I have gone back and forth on this and the only reason I am not currently using my own name is because of my psychology job. I am seriously considering switching back to using my name as my blog domain in the future because sometimes I find my blog name to be limiting. Using your own name leaves things wide open. Choose a blog name where you can also have the social media accounts. You can use a site like Namevine.com to look for names that have social media handles available too. Choose a name that is short and memorable. I always purchase my domain names at Namecheap. Their prices are reasonable and there are tutorials all over the internet for how to integrate Namecheap with different services if needed. An easier method is to purchase your domain name when setting up hosting. I will be talking about setting up hosting with the company I recommend, so stay tuned. If you wish to go the easiest route, sign up with your hosting company. Ok, you can totally start a blog for free on a site like Blogger or even on WordPress. If you decide to do so, you may be able to skip purchasing a domain as well. I’m not 100% sure on this, I personally have never created a blog with free hosting. I don’t recommend you do either. If you decide to create a blog on a free site, not only will you lose a ton of flexibility in what you can do with your blog, you will also be giving up ownership of your blog. Let me give you an example. I run a Facebook group for bloggers and several of the people in my group have their blogs hosted on Facebook. I’m not exactly sure how they do this, but I’ve seen this a few times. I would love to ask them what they plan to do if Facebook bans them or decides to stop showing their content to people. If Facebook shuts down their account, they lose everything. When you rely on a company to host your blog for free, you give up control of your blog. They can shut you down at any time. You don’t really own that. I highly recommend paying for hosting for your blog. It is not very expensive, but it gives you the peace of mind to know that your blog is yours. You have control of what happens to it for the most part (as long as you follow security practices and no one hacks you). I’ve used a few blog hosts. I started out with Bluehost, and while I did not have any trouble with them, I did not stay with them for very long. I ended up joining a membership site that hosted my blog for me. This was a great situation for me at the time, but ended up causing some difficulty when I wanted to do a few more advanced things with my blog. When I used the membership site for hosting, they had control over what I could and could not do with my blog. I won’t go into the details since what I wanted to do was kind of advanced, but let’s just say I was kind of irritated to not be able to do these things. At the same time, I noticed my blog was receiving low scores on speed when tested with Google. This was not good since speed affects rankings on Google. It is so easy to set up your blog on Siteground. Anyone can do it. If you struggle they will set you up for free. They moved my blog from the membership site to their service for me. This was awesome because it was super complicated and I would have had difficulty figuring this out. When I ran into a little difficulty early on and my site wasn’t coming up, I emailed them and they fixed it in less than five minutes. This was amazing! I am grateful to them since I was at a blogging conference at the time and needed to work on my blog. Siteground’s servers are fast. I know I already mentioned this one, but this is so important. Readers are so distracted nowadays and if your site loads slowly, they may not even stay long enough to see the great stuff you worked so hard on. Siteground’s servers are stable and they rarely “go down.” No one wants to hear that their website isn’t working because their host is down. That can result in loss of lots of money in your business. If your business is closed, you can’t make money! Siteground promises to compensate you if your blog is “down” more than .1% of the time in a year. This just goes to show how much they stand behind their product. Siteground is affordable. You can start for as little as $3.95 a month! You get to install WordPress for free. Siteground has a guarantee in case you decide they are not right for you. If you sign up and have any issues getting set up, you can shoot me an email and I will help you. Self-hosting is important and Siteground allows you to be self-hosted. (This is instead of using a free site that hosts your blog for you). You will appear more professional to readers and people who will buy from you. Other bloggers and businesses will also take you more seriously if you are using Siteground instead of a free site. When I was researching which host to go with, Siteground was a clear winner. They had the most positive comments in social media discussions. 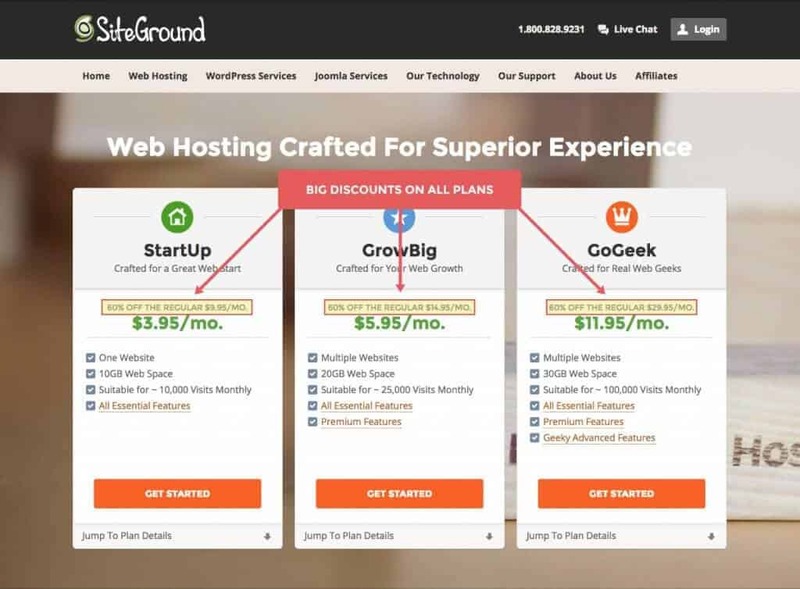 Although other hosting sites may pay more commissions to affiliates (I don’t know if they do), Siteground is the one I stand behind. If you are just starting out, you likely only need the StartUp package. You can host one blog on there and get up to 10,000 visits a month. You can always upgrade later if you want. You don’t need to spend more money than necessary since you will need some time to ramp up your traffic. Setting up your blog on Siteground is easy. If you purchased your domain on Namecheap, you will have to connect your domain to your hosting account. You can find tutorials everywhere for this. Here is a great one with pictures. If you bought your domain on Siteground itself you don’t really have to do anything. Once you have your nameservers pointing to Siteground, the next step is to Install WordPress! Yay, you almost have a blog at this point. It will take some time to get your blog exactly where you want it, so don’t spend a ton of time here right now. You can use either a free theme or a premium theme. I recommend going with a premium theme because it is more professional looking and is more likely to get you what you need. For instance, my theme is Refined by Restored316. Before I got this theme, my blog looked pretty clunky. I’m not a graphic designer and although I am good with technology, I was NOT good at making my blog pretty. Although how to do all the things on your blog is beyond the scope of this article, I want to let you know that the way to write a post is by clicking posts when you are in your dashboard. Posts are what you usually see when you read an article from someone on their blog. There is another thing called “pages” and those are typically things like your “about” page. As you start working on your blogging business, you are going to want to find a way to collect emails from your readers. This allows you to have a better relationship with them and to communicate with them more frequently. I highly recommend using Convertkit for your email newsletters and communication with your readers. It was made for bloggers and simplifies a lot of complicated workflows.